Could this be connected to the Digimon Twin ? Re: New Digimon Story Games ? i just hope those aren&#39;t the actual screen colors in those screenshots &amp; those digimon look like new versions of terriermon. btw, what is Digimon Twin? A new V-Pet, rumoured to be related to a 6th series of Digimon Anime. And I donÂ´t think these are the actual screen colors. Lunamon!? I knew they&#39;d make a Digimon with that name eventually! Apparently it looks a little like the PokÃ©mon games in which there are two versions of a game that are interlinked by some common plotline or something, and would probably be able to connect and interact with each other. 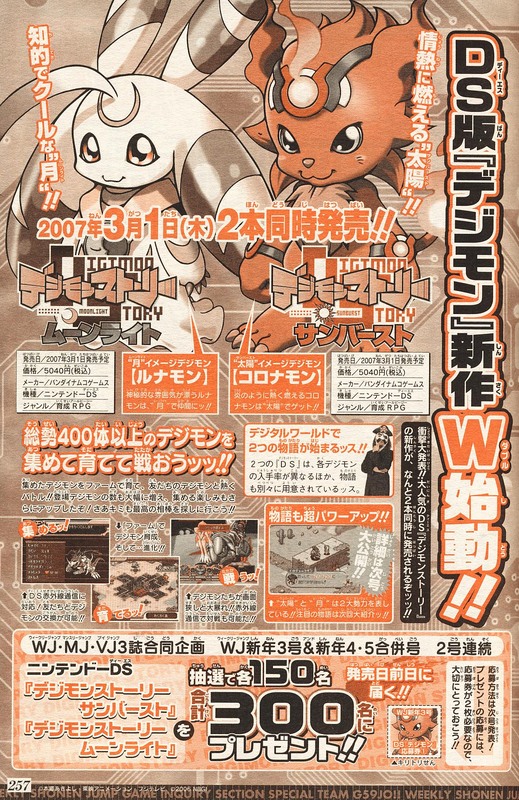 The one with Lunamon is called &quot;Digimon Story Moonlight&quot;, and the other Digimon, Coronamon, is &quot;Digimon Story Sunburst&quot;. The kanji for moon is translated as &quot;moonlight&quot;, and the kanji for sun is translated as &quot;sunburst&quot;, via katakana. If anyone looks like an older Digimon then Coronamon resembles Gaomon a bit. LetÂ´s hope they make it better than the Pokemon Games and the Stories are not exactly the same in both Versions. Strange that there is no Reptile Digimon. There seems to be 400 Digimon (Twice then the last game), and it&#39;s going to be released in March, 1, 2007!!! And Sun and Moon are a Twin Theme. Ooh, I really like Coronamon. :3 Nice find. Is it sure that the scan isnÂ´t a fake? Wow, I can hear the uneducated fans yelling &quot;rip off&quot; already. I&#39;m guessing Digimon Story must of done really well for this to happen. Is that Lilamon? That must mean Raramon is in it! Yeah!